EUR/USD is moving up to around 1.1300 in the wake of the new week after tumbling down on Friday. Fears of a looming recession weigh on the mood. What’s next? 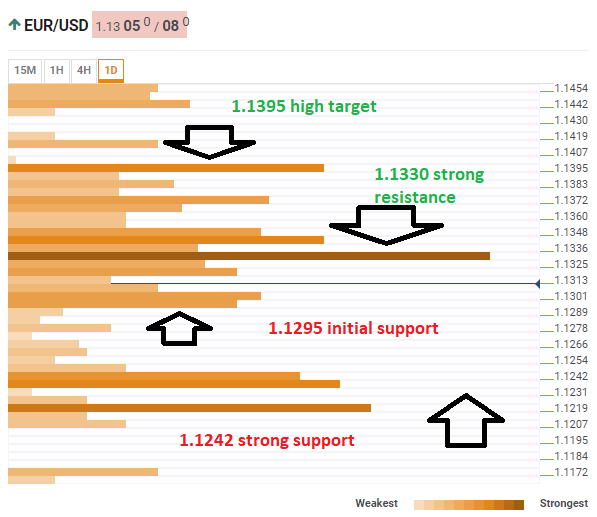 The Technical Confluences Indicator shows that the euro/dollar faces tough resistance at 1.1330 where a dense cluster of resistance lines awaits it. This includes the Simple Moving Average 200-4h, the Bollinger Band one-day Middle, the SMA 10-4h, the SMA 10-one-day, the Fibonacci 38.2% one-month, the SMA 200-1h, and the Fibonacci 38.2% one-week. If it breaks higher, the next cap awaits at 1.1395which is where the Fibonacci 61.8% and the previous daily high converge. Looking down, weak support awaits at 1.1295where we see the confluence of the BB 1h-Middle, the SMA 10-1h, the SMA 50-15m, the BB 15min-Middle, and the Fibonacci 23.6% one-day. Further down, more significant support awaits at 1.1242 where the convergence of the previous monthly low and the Pivot Point one-week Support 1 awaits the pair.